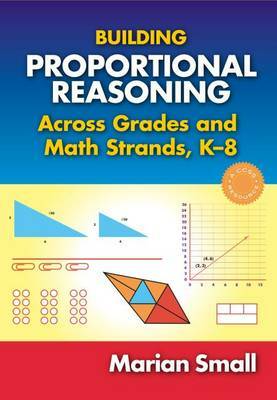 Although proportional reasoning is not formally introduced as a topic in the Common Core and other mathematics curricula until 6th grade, introducing its fundamental ideas in the early grades helps students develop essential skills in ratios, percentages, and other proportional representations when they reach the upper grades. The author takes this complex subject and crafts examples and questions that help teachers see the larger purpose in teaching concepts, such as unitizing, and how that understanding is essential for more complex ideas, such as ratios. Teachers and vertical teams can see how the concepts can build year after year. This new resource by well-known professional developer Marian Small suggests questions that are both interesting for students and useful for providing diagnostic information to teachers. Chapters are organized by grade level (K-8) around the Common Core State Standards for Mathematics to help teachers use the resource more easily. "The book's notable strengths are the connections it makes between the early grades and the development of proportional reasoning, the clarity of the writing and organization, and the variety of models it uses to illustrate ideas."